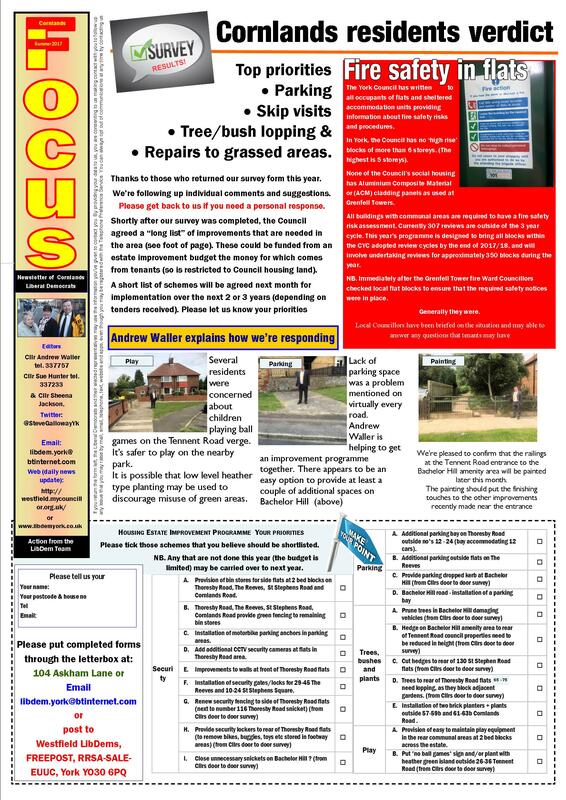 Annual Council tenants satisfaction survey results have been published. Not surprisingly they show little change for the views record last year. 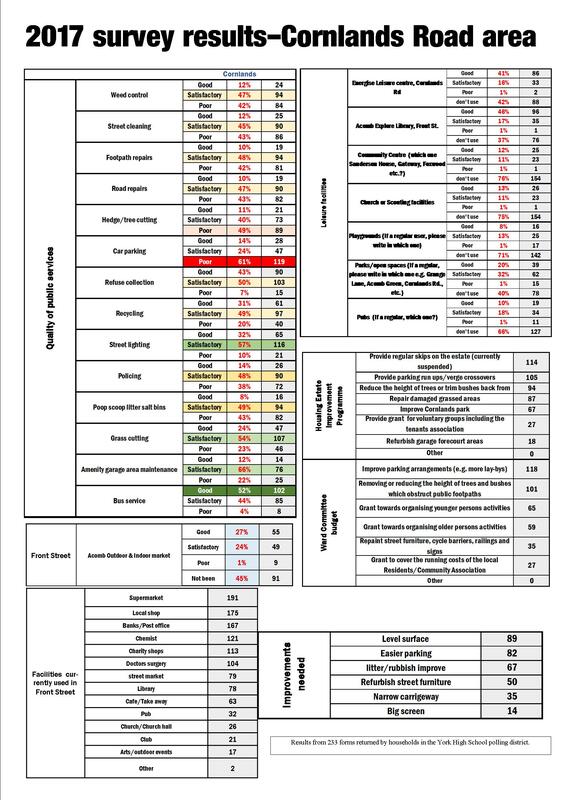 Highest level of dissatisfaction relates to poor parking provision in estates. Despite funding having been made available, Council officials seem unable to deliver the additional parking pal-bys in locations that have been identified. It is a problem in parts of the Westfield Ward where 6 schemes, some dating back as far as 2016, have yet to be started. Only one, in Spurr Court, has been completed recently. 48% say drug use or dealing is a problem in their area. The Council was criticised by 1/3 tenants who said the landlord did not listen to their views. 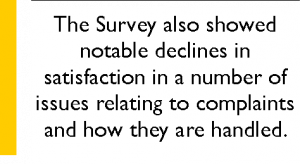 This was a marked increase in dissatisfaction since the previous survey was completed. In 2018 the York Federation of Tenants Associations was wound up, with no independent voice now articulating residents concerns in many of the City’s estates. The Council has published its latest financial and performance update. It reveals that it could overspend this year’s budget by as much as £1.5 million. The expectation is that the Council will outturn on target. A major source of complaint is paradoxically complaint handing. The Council claims to have answered “50% of complaints within 5 working days”. ….but we have a current instance of a complaint registered on 27th December 2018 which hasn’t even been acknowledged yet. The Council needs to improve its exception reporting systems and inject some fresh drive into its customer relationship processes. Another key concern is the impact that the Council is having on delayed discharges (bed blocking) at the hospital. “The total number of days that patients resident in York have been delayed, for all reasons, during the last twelve months for which statistics have been published (November 17 – October 18) was 10,655 which equates to, on average, 29 beds each day occupied because of DToC across the health and social care system. From August to October 2018, this figure was 2,967 days which equates to 32 beds each day”. The Council says that the closure of two large nursing homes in the city has impacted on the ability of Adult Social Care to place patients quickly, as well as considerable pressures in both the residential and homecare markets. The future of the Greenworks section of Yorkcraft has also never been properly explained. The Council is reducing the budget by a further £160,000 for adult social care workers, in supported employment, during the next financial year. So the future looks bleak for some of the workers who are a familiar sight as they deliver newsletters to various parts of the City. Following the decision by the Council to suspend its housing modernisation programme the number of Council homes not meeting the decency standard has soared to 546. City of York Council is asking residents and businesses for their views on proposals to improve key junctions on Wigginton Road (near York Hospital). Plans include rebuilding the junction between Haxby Road, Wigginton Road and Clarence Street and replacing the existing mini-roundabout between Wigginton Road and Fountayne Street with a new junction. replace the traffic signals at the Haxby Road, Wigginton Road, Clarence Street junction. To submit feedback on the proposals email buses@york.gov.uk or post responses to Julian Ridge, Better Bus Area Manager, City of York Council, West Offices, York, YO1 6GA – by Sunday 2 September 2018. Further information about the proposals, including plans, can be found at www.itravelyork.info (apparently) . Or, view the FAQs below. 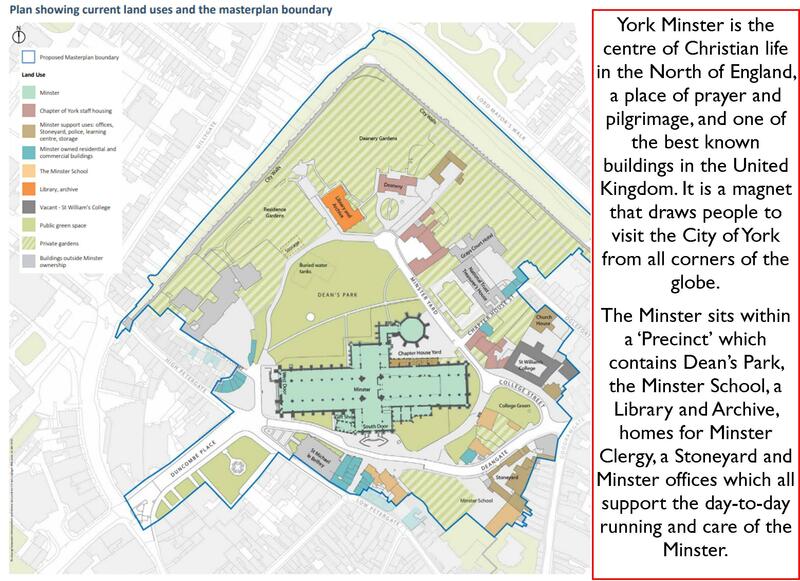 York Minster is consulting on plans for the area surrounding the Cathedral. The Minster authorities are preparing a masterplan to explore how the Precinct could evolve in the future to meet the changing needs of its community and visitors. The Minster Chapter recognise that it is a sensitive and complex area of the City and its future care must be planned for carefully. The intention is that the masterplan will be adopted as part of the City’s planning policy. It will provide the Minster with a clear strategy for the next twenty years and will be used to secure funding for individual projects. The Minster is working with the City of York Council, Historic England, a wide range of stakeholders and the community to get the best plan in place. It is at a very early stage. An exhibition in Deans Park explains what they hope to achieve through the masterplan process. Residents and visitors are being invited to give their ideas, suggestions and thoughts. The consultation will run until midnight on Saturday 30 June. This is a welcome initiative from the custodians of York’s best known landmark. The City can’t stand still and some proposals – including the pedestrianisation and paving of Duncombe Place – are long overdue. However, the devil (him again) will be in the detail and not everyone will share the Chapters view that Deans Park should be a more lively place. An “oasis of calm” in a busy world might get more votes! Still there is room for improvement and most would be delighted if the historic St Williams College building was brought back into use. 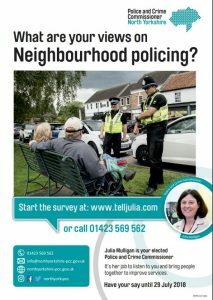 The Police and Crime Commissioner (PCC) has started an “on line” survey which she says is aimed at getting residents views about neighbourhood policing. In some ways this is well timed as the summer period invariably brings a peak in some forms of crime – notably anti-social behaviour. We have already seen an escalation in complaints about the “mad moped” brigade while environmental crime (e.g. dumping, dog fouling) are still at high levels. However, they are yet to reach the heights seen last year when the police presence was very low. 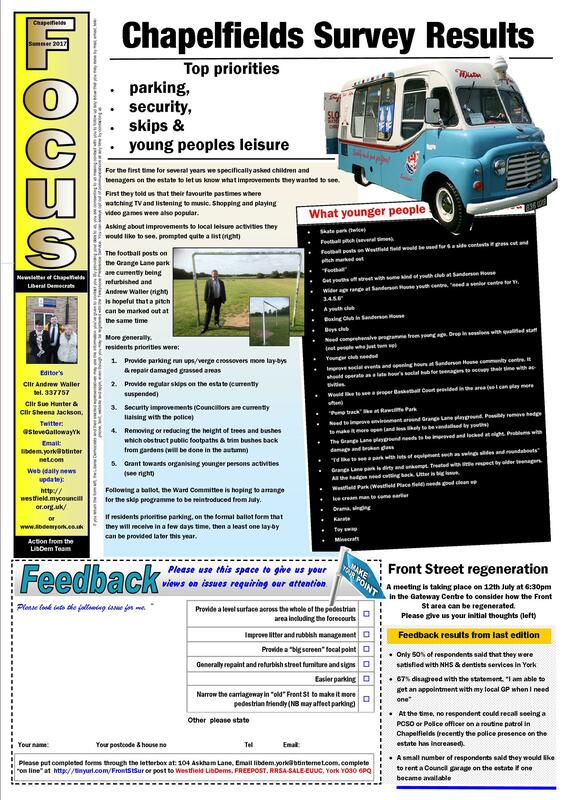 Since then there has been a gradual and welcome improvement with more patrols by PCSOs evident. The survey begins by asking about satisfaction with a range of public services. There will be a suspicion that this will be to allow the PCC to say that the quality of policing is more highly rated than, say, road maintenance. The real comparison is with historical performance. The effectiveness of policing has never been the same in sub-urban parts of York since anti-social behaviour activities were centralised into a “hub” at West Offices. Almost overnight communication channels between residents and named police officers were broken, losing a valuable channel of information about the causes of crime and those responsible. The boundaries of the neighbourhood policing units seem to have been in a constant state of flux. Lists of local officers need to be regularly updated and included on public noticeboards, social media pages etc. 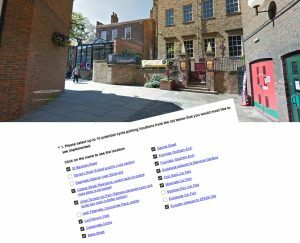 The local activities web page for York South famously is only updated a couple of times a year, although there are many more things going on than are publicised. The survey fails to probe whether residents have confidence in the criminal justice system in its entirety. Many reported crimes go undetected while courts seem to lack effective powers to deter repeat offences. The police seem reluctant to publish performance stats at a neighbourhood level. Information is available at https://www.police.uk/ but accessing it is awkward. Residents Associations no longer routinely receive information. Many Neighbourhood Watch organisations have folded in recent years. We hope that the results of the survey will be published at neighbourhood level. Snow! How was it for you? With the snow now finally – apparently – at an end, Liberal Democrats have launched an “on line” survey aimed at finding out how local public services coped this winter. 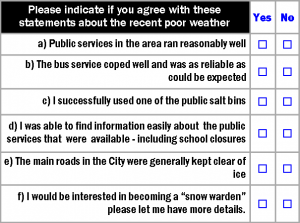 Residents are being asked to give their verdict on a number of issues including salt bins, school closure information, gritting schedules, bus services and the effectiveness of the “snow warden” volunteer programme. Residents have just a few more days to give their views on potential sites for new cycle racks in the city centre. City of York Council have worked ‘in tandem’ with York BID to identify 18 potential new sites for cycle racks. Police are warning that robust action will be taken following eight days of high level anti-social behaviour in York’s Chapelfields estate. There have been more than twenty five incidents of anti-social behaviour in the Chaplefields area between 9 August and 16 August. The nature of the incidents, have included anti-social use of mopeds and motorcycles, arson, drug use and criminal damage. The groups of youths, sometimes up to thirty in number, causing this hazardous disruption have also been using threatening and abusive language towards residents and the police. Circumstances of some of the more serious reports involved a flat window being forced open and fireworks thrown inside, a youth threatening an officer with a piece of wood a group climbing onto the school roof, where the skylight has been previously smashed by a group of the youths. 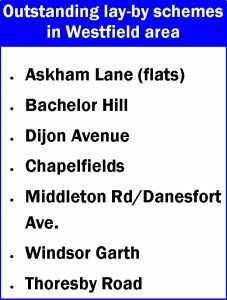 The incidents have taken places across various locations in the area including Bramham Road, Bramham Avenue, Chaplefields Road, Westfield Place and Barkston Grove. A dispersal order is going to be implemented at 5 pm today which will last for 48 hours. The dispersal order will cover an area of Bramham Road which includes the junction of Barkston Grove, and another area of Bramham Road which covers Costcutter and the junctions either side of Bramham avenue. The levels of anti-social behaviour this group are committing is just astonishing and they are causing so much misery amongst the community in Chaplefields. Many residents, including the elderly and vulnerable, have felt intimidated, have been verbally abused, and are scared in their own home. This is totally unacceptable behaviour. These youths are ruining what should be a respectable community enjoying the summer months and school holidays. Instead, we are seeing this group of defiant individuals who have no intentions other than to be nasty, cause desolation and despair amongst the public. My team of officers and PCSOs are working hard to identify these youths and exercise the powers we can to deter them from this anti-social behaviour. A dispersal order will be put in place today that will last for 48 hours. Anyone who breaks the order will be arrested. If the order is deemed successful, it will be continued throughout next week”. Anyone who witnesses anti-social behaviour or who has any information is asked to contact police. Dial 101, press 1 and speak to the force control room. In the recent survey conducted by local Councillors in the Chapelfields estate many residents complained about what they regarded as the low police profile in the area. 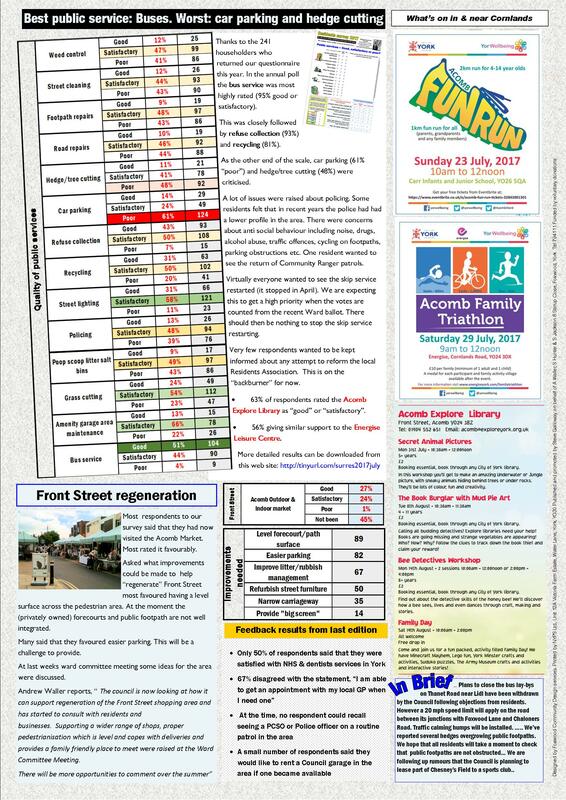 The results, from the Westfield Councillors annual survey of public opinion, have been updated to include the Cornlands Road area. Residents said they were satisfied with most public services in the area. The best performing was the bus service, mirroring the similar result obtained in the nearby Chapelfields estate. Lack of car parking on local roads was the key grievance. 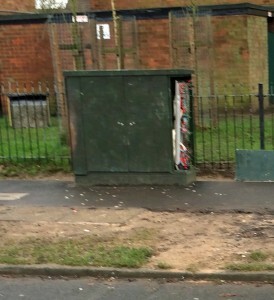 Residents wanted to see the return of a regular skip service. There were many complaints about overgrown Council owned trees and bushes which are obstructing paths and gardens. Several policing issues were highlighted with anti social behaviour apparently on the increase. The top priority for regeneration of the Front Street area was the provision of level forecourts across the whole shopping area. The future of the Front Street area is due to be discussed at a public meeting taking place tomorrow (Wednesday) at the Gateway Centre starting at 6:30pm.